This page is to provide instructions for current members to renew their membership through 2018. This is required if you plan to register for the Munsell 2018 Celebration as an ISCC member. If you do not plan to attend the 2018 meeting, you can safely wait for your renewal notice in January. But if you really want to renew anyways, we will not stop you! You must be logged in to the ISCC web page. Once logged in, go to your profile page. You will see something like the image below. 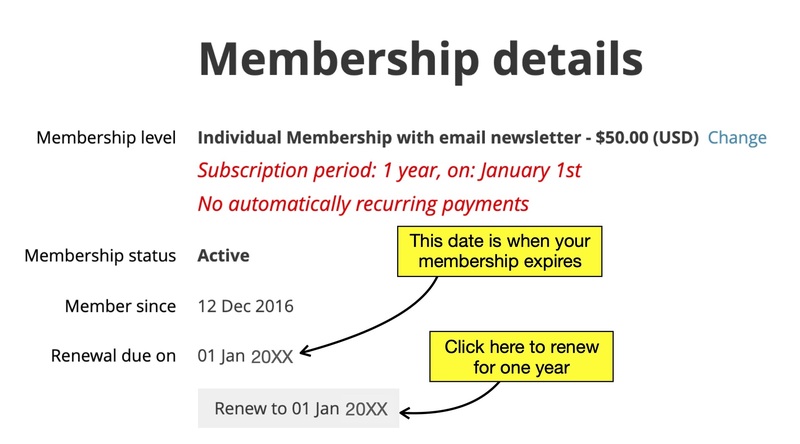 As noted in the yellow boxes, if your membership renewal is 2019, you are all set. If your membership renewal is 2018, click the Renew button and follow the directions. After renewing, please proceed to the Munsell 2018 Registration page and complete your registration.